Neuroscientist Eric Hoopfer likes to watch animals fight. But these aren’t the kind of fights that could get him arrested – no roosters or pit bulls are involved. Hoopfer watches fruit flies. Very close up. The tiny insects are the size of a pinhead, with big red eyes, golden translucent bodies and iridescent wings. For flies, they’re quite handsome. But you probably have only ever seen them flying around an overripe piece of fruit. In the “Fly Behavior” room at the California Institute of Technology, in Pasadena, Hoopfer places pairs of male fruit flies in tiny glass chambers. When they start fighting, they look like martial arts practitioners: They stand face to face and tip each other over; they lunge, roll around and even toss each other, sumo-wrestler style. But this isn’t about entertainment. Hoopfer is trying to understand how the brain works. 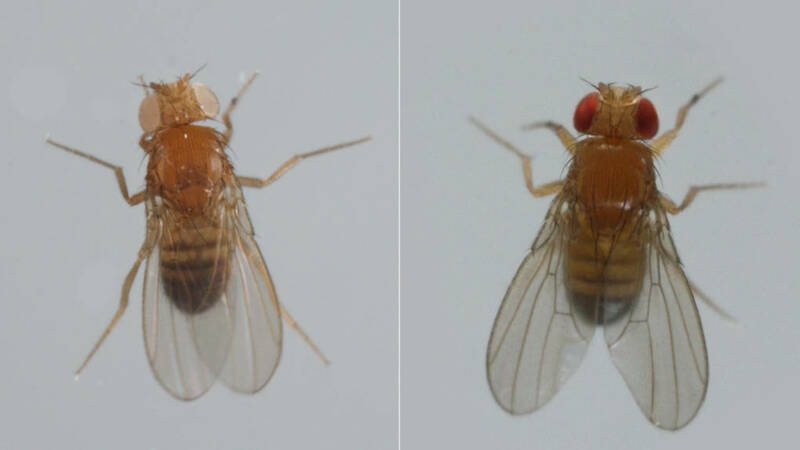 Scientists have regularly used fruit flies as research subjects since 1910, when Columbia University biologist Thomas Hunt Morgan discovered a mutant white-eyed fly among his normal red-eyed flies and used the discovery to describe how genes get passed on from generation to generation. More recently, fruit flies are helping scientists understand human diseases like cancer, Parkinson’s and Alzheimer’s. They can do this because they’re a simpler version of us. They have about the same number of genes: 20,000 or so. About 75 percent of the genes that make humans sick are found, in a very similar form, in fruit flies. These insects reproduce quickly and are cheap to keep in the lab. Now, they’re helping scientists create a map of the brain that shows what groups of neurons control social behaviors. When the aggressive fruit flies at Caltech fight, Hoopfer and his colleagues monitor which parts of their brains the flies are using. The researchers can see clusters of neurons lighting up. 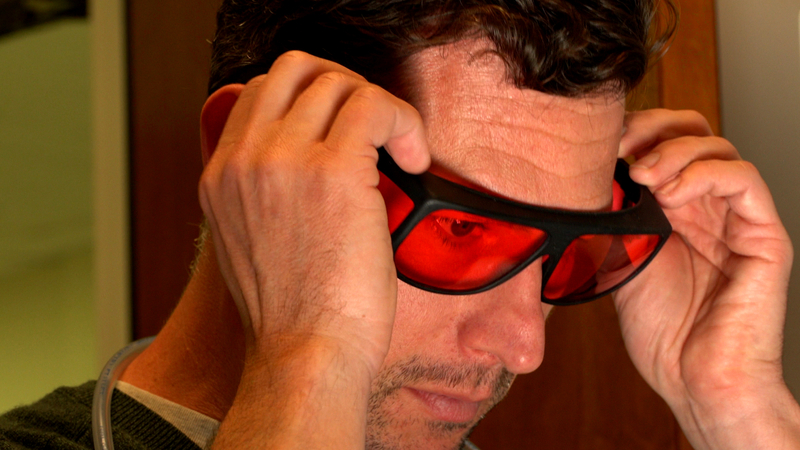 In the future, they hope this can help our understanding of conditions that tap into human emotional states, like depression or addiction. Circuits in our brains that make us stay mad, for example, could hold the key to developing better treatments for mental illness. 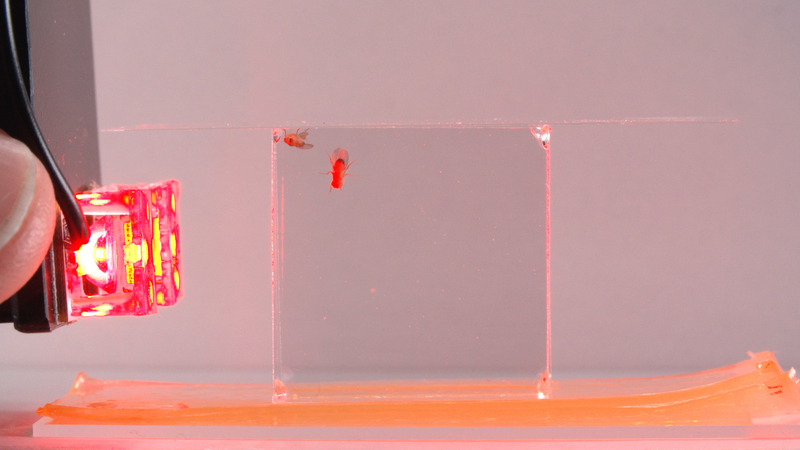 In the fly room, Hoopfer flashes a pair of male fruit flies with a red light. He has genetically altered them to be sensitive to the light. It activates a cluster of neurons in the flies’ brains and they start to fight almost immediately. But when he changes the intensity of the red light, they do something very different. They lift and vibrate just one wing, a sign that they’re courting the other fly. The researchers were surprised to see that the same neurons controlled such different behaviors. What do fighting and flirting have in common? 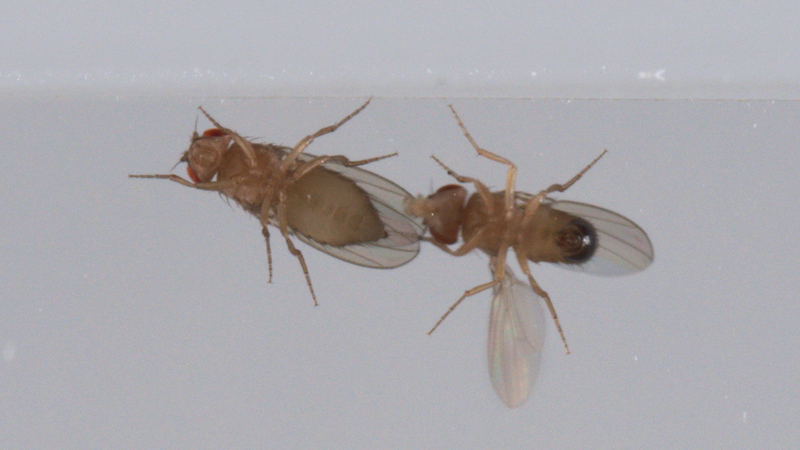 In both, flies are pretty hot and bothered; these neurons control something like emotional arousal. Hoopfer and his colleagues are interested precisely in circuits like these that control a constellation of social behaviors. There’s evidence that mice brains have neurons that do something similar. So even though a fly – or a mouse, for that matter – isn’t the same as a human, this tiny insect could help pinpoint circuits in the human brain that work in a similar way as the fly’s circuits do. “Maybe there are certain ways that evolution has solved these basic problems of how to control behavior and internal states that are associated with behaviors,” said Hoopfer. Researchers hope that a more precise knowledge of the human brain – brought on by an understanding of the fruit fly’s brain – could one day lead to the development of better drugs to treat depression and other mental illnesses. But disorders like depression are complex, cautions Anderson, and nobody should expect new treatments anytime soon. And yet, clues are coming from some of the most simple organisms. So the next time you find a fruit fly on your piece of banana, you might want to think twice before swatting it.